I saw the fifth Die Hard film in theaters when it opened in February, 2013, and reviewed it here. There was a palpable sense of deflation among those in attendance as the relatively short (for this series) film dragged on. 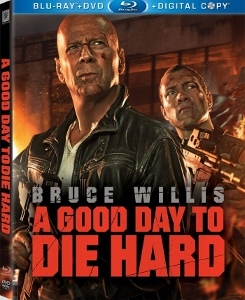 In a series where two-hour-plus is the standard, it’s really saying something that at 98 minutes A Good Day to Die Hard feels like the longest one. A lot of brokenhearted action fans left A Good Day during its mere five weeks in wide release. It limped to the lowest domestic box office total of the franchise: $67.3 million. Overseas grosses pushed it over the $300 million mark, apparently guaranteeing a sixth installment (reportedly to be set in Japan). But for those who love Bruce Willis’ signature character, John McClane, there was definitely something obviously wrong with this outing. There’s a good reason it was dumped into theaters in winter when the previous four were all summer releases. It’s a dog. Having revisited the film now that it’s on Blu-ray, I can’t bring myself to delve into the plot for a third time. My theatrical review is here and my Blu-ray coverage on The Morton Report can be seen here. Suffice it to say, this doesn’t deserve the Die Hard name. Bruce Willis has made a lot of bad movies. While the Die Hard series has not been all finely-cut diamonds (the sequels have all been overlong), none can be counted as a stain on the Willis filmography. Until now, that is. McClane ventures out to Russia to discover how his son Jack (Jai Courtney) got into so much trouble involving dirty politicians. He quickly realizes Jack is an undercover CIA agent whose cover is now blown. A Good Day turns into a buddy flick as father and son are led to Chernobyl, where shocking secrets are uncovered. There’s no reason any of this couldn’t have worked. But the execution is botched, despite top notch production values. The story is convoluted and doesn’t inspire viewers to invest any thought in it. But the Blu-ray itself is, in a word, killer. Jonathan Sela’s cinematography looks terrific, more nuanced and detailed by far than I remember seeing on the big screen. It’s quite stylized, with outdoor sequences looking grittily hyper-realistic and indoor scenes alternating between cool blues and warm, glowing oranges. The transfer presents these sleek color schemes in perfect detail. Even better than the flawless visuals, however, is the DTS-HD MA 7.1 soundtrack, which offers reference-quality action audio from start to finish. Considering the brief running time, the action is close to nonstop. While this works against A Good Day from a narrative standpoint, it keeps the speakers busy. The mix definitely blew me away with how intricately it allows the crashes and explosions to be head. Series fans should also appreciate that, despite the movie’s suckiness, no expense was spared to create an extensive lineup of special features. First off, the film is offered as an extended cut (differences are negligible, with only about three or four minutes added). About 14 minutes of unrevelatory deleted scenes are presented. The rest of the material is focused primarily on the technical aspects of making the film, suggesting that far too much attention went into tech instead of story. The centerpiece is a multi-part, one-hour documentary called “Making it Hard to Die” that gets pretty self-congratulatory but includes a lot of meat-and-potatoes info. 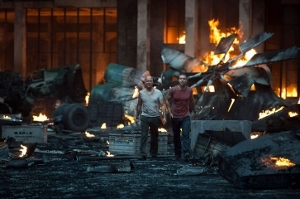 “Anatomy of a Car Chase” focuses on the first big action set piece in the film, the massive car chase in which Jai Courtney is being pursued. This runs some 26 minutes and offers a good portrait of how much expertise went into the sequence. Three under-ten-minute featurettes focus on different topics, including the father/son team-up, the return of John McClane (six years after the last film), and the too-generic villains. Additional pieces on “pre-vis” animatics, visual effects, storyboards, and concept art are included as well. 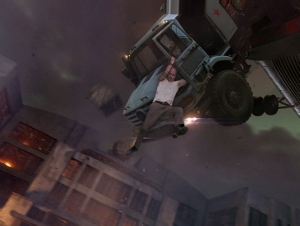 If that weren’t enough, “Maximum McClane” offers up a montage of McClane’s greatest hits throughout the series (it only made me wish I had been watching one of the earlier films). On top of it all, director John Moore and his first A.D. Mark Cotone provide an amiable commentary track. It’s sad when the special features are actually more impressive and entertaining than the movie they are intended to supplement. Such is the case with the dismal A Good Day to Die Hard. I think I’m going to go buy this right now!! !